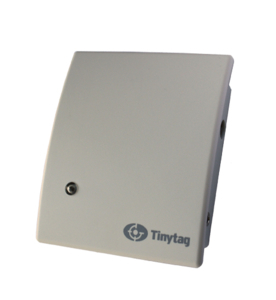 A dedicated CO2 data logger is one of the latest additions to the Tinytag range. This competitively priced unit is highly accurate and ideally suited to applications such as building monitoring. Building on the Tinytag reputation for ease of use and reliability, the CO2 data logger can play a key role in helping to verify that a building's ventilation system is performing correctly. The logger uses a self-calibrating infrared sensor to determine carbon dioxide concentrations, and to ensure high accuracy, the sensor compensates for the aging of the infrared source to ensure outstanding long term stability. The discreet unit is mains powered and designed to be positioned unobtrusively where required for effective monitoring throughout a building or installation. A flashing red LED light on the unit indicates if there has been an interruption to the power supply. There is a growing awareness in the UK and throughout Europe of the need to monitor carbon dioxide levels within buildings to help determine indoor air quality, with recommended guidelines in place for specific premises such as schools. Monitoring CO2 levels enables the necessary steps to be taken to maintain optimum internal air quality, identifying under-ventilated areas - the source of most air quality complaints - and enabling corrective action to be taken for the comfort and wellbeing of those inside. Areas with poor ventilation can lead to a build-up in carbon dioxide levels which can cause reduced concentration levels in occupants and in some cases can lead to health problems. The logger will also help identify energy saving options in over-ventilated spaces. Data from the CO2 logger is downloaded to a PC via a USB cable and viewed with the easy to use Tinytag Explorer software, with data clearly presented as graphs and tables. Users are able to set a desired upper ppm (parts per million) concentration limit which will trigger the flashing red LED light if this level is reached. Two versions of the CO2 logger are available: the standard unit TGE-0010 is a 0-2000ppm version which is suitable for most building monitoring applications. For more specialised situations (where higher concetrations of CO2 can be found) a 0-5000ppm version TGE-0011 is available. Monitor carbon dioxide with the Tinytag CO2 data logger.